One challenge for frontend projects is handling authentication. 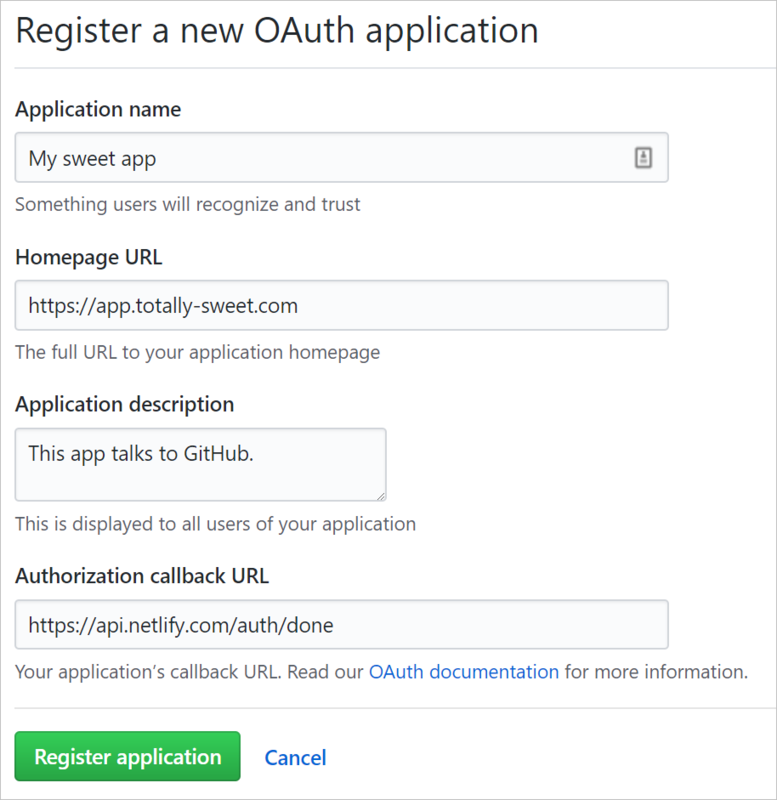 OAuth2 is a widely accepted standard used by many services and APIs, but the OAuth authentication process requires a server to send a signed request to the OAuth server, signed with a secret that you can never expose to the client side of your app. Netlify solves this problem by providing an integrated service that will sign the OAuth requests for you and give back an access token ready to use. Before you can use an authentication provider, you’ll need to register an API application with the provider and configure the credentials through the Netlify UI. In GitHub, go to your account Settings, and click Oauth Applications under Developer Settings (or use this shortcut). For the Authorization callback URL, enter https://api.netlify.com/auth/done. The other fields can contain anything you want. Go to your Netlify dashboard and click on your project. Navigate to Settings > Access control > OAuth. Under Authentication Providers, click Install Provider. Select GitHub and enter the Client ID and Client Secret, then save. Once you’ve configured an authentication provider you can use it to obtain an access token in your app. You can then use the generated authentication token in your calls to the service API.